Mastiff - A Gammonwood Tale - Part Two - This Forum is brought to you by The Mastiff Sweet Spot and Friends of the Forum. "Mastiff - A Gammonwood Tale"
We do so hope you enjoy this next contribution. Looking forward to it! Thank you guys for taking the time and effort to do this. Very well done, and very enjoyable to watch, but the music to me, is to droll and dreary to match the happy dogs and modern set up of the film ! So as the first part, this is a great video. Congrats and thanks for sharing !!! This production has never before been accomplished, inspired, implemented, or attempted. It's a gift to ALL Mastiff fanciers, representing hundreds, if not thousands of hours of independent time & money, spent on production, editing & collating, interviews, international logistics, camera time & crews, recordings and historical vignettes, spanning a global reference for all to witness in several DVD's, which are beginning to emerge for all Mastiff fanciers to share & enjoy as a collectors treasure on the breed. The people that have made this happen are Jennifer & Simon of Gammonwood productions, they alone have taken this project under their wing and enabled this documentary to breath life, for all to experience & enjoy for many years to come. This project has taken years to produce and is still a work in process. Few if any, can imagine the amount of effort needed in bringing this production to light and we ALL owe a substantial debt of gratitude for the effort made in it's release on YouTube & the more complete version on DVD! No matter how we may differ in our other views, regarding the various topics under forum debates, this documentary serves to benefit every Mastiff fancier, and in so doing, heralds an act of unprecedented appreciation, for all who have participated & observed in this engaging film. My compliments to all who participated in the making of this film and especially to Col. D. Hancock, who anchored the narrative and gave flavor to this effort throughout the filming. To Jen & Simon, you know my personal thoughts on this topic & production, and my 9 hours spent on filming my share before the edit. The footage on Betty B. and all of the other participants, can only serve as a memorial to your devotion, in your efforts placed on your love of this breed for years to come. I hope Mastiff fanciers can fully appreciate what has been done for all of us, by this extensive effort on your behalf. At present, I don't feel that most fully recognize the effort made by you & Simon. Therefore, I'm posting this response to acknowledge that determination in personal dedication you have both employed, in bringing this production to light and in adding to the overall continuity of Mastiff lore & grandeur through film. Steve was more loquacious and precise than I. So, to that, I'll simply say "+1" to his comments! And, again, thank you and well done! Thank you, Jennifer and Simon. That was a labor of love if I ever saw one. Steve and Janine both did a great job. Janet's contributions were essential and I loved the painting of Paddington that hung over her shoulder as she spoke about our wonderful breed. The Colonel did a great job as the main narrator and he spoke fearlessly about some of the things that many fanciers don't dare bring up. His discussion of bone was particularly interesting. For me, Betty Baxter was the film's anchor. She came in at all the right times (great editing) and really strengthened the film's emotional impact. I have very strong emotions for this breed and Betty's on-screen moments left me teary eyed. She seems like she is ready to go around again "just one more time", but her body is getting in the way. Her discussion of "her favorite" was moving, to say the least. Can we buy this on DVD in NTSC format? Thank you so much, and ditto everything Steve said, as usual he words things perfectly. I will pass your thoughts on to Betty H, she will be thrilled. I have known so many people at the end of their lives who simply accept their new limitations. Betty Baxter, as shown in the film, is not one of them. Her attitude betrays a Woman who wants more; "just one more great dog...one more amazing run...one more best friend". Her passion is undeniable and inspiring. You can purchase the Paddington Bear print H. I am sure they still have it on the OEMC website under shop. It is one of a collection of prints of some beautiful champions. Nice to see Betty in this film . Her pure authenticity , not only as a Mastiff fancier but also as a person , seems to be unmatchable . Thx . Hope she’s recovering well from her latest stay at the hospital , fingers crossed . She recovered really well Marcel. We already have our next trip planned for the new year, there is no stopping her. I cannot wait to see her again. I shall pass on your good wishes. She always speaks of you with great fondness. Thank you for this courageous work of art. The incredible footage, the heartfelt mastiff tales and the original music that drew us into the heart of the bittersweet mastiff story is truly a masterpiece. We loved every minute of it and will treasure it always. What a great video!!! And now I know what Steve looks like so I can say hello at Bucks next year (if he is there)!!! My first show at Bucks, with Truman in the ring, was the one where Betty Baxter served as judge. I can tell you that I have never been more impressed with a person and her dedication to the breed. First of all, she was elderly and physically exhausted. She stood and looked over each and every mastiff from the first one until the last one. That show went until 5 or 5:30. She was just as sweet and patient with the first group as she was with the last group. I know she was in pain and tired by the time she got to Best of Breed...we all did...but it wasn't by the way she acted, that's for sure. 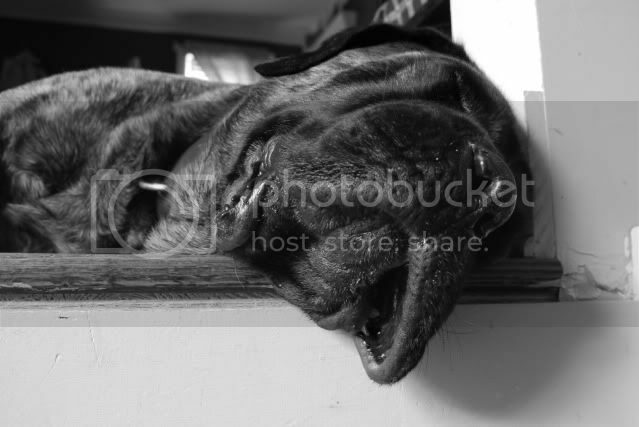 Her contribution to mastiffs in general is remarkable. She left quite an impression on me as well. I think she had something nice to say about every single mastiff she examined. A true lover of the breed. I just watched all 3 videos. Thank you so much for taking the time to put these together - the Mastiff is such an amazing breed. I feel so fortunate to have one and another "on the way!" Ours is exactly as the video described - I can't believe how intelligent, loyal and protective they are. The history on how they came about is so intriguing and I especially loved learning about the Pied's and how their coloring demonstrates old genetics resurfacing. Well done. Janine, I looked and it is available for purchase, but not in American dollars. Maybe I could ask my cousin in London to buy it and send it to me. It would look nice hanging in my den in a great frame. This production is now available on DVD. I got my copy yesterday and it was lovely to watch it on the big screen. Simon, Jennifer and Angus have done such a wonderful job and it really is a must have. Where do i find part 1? Love the Gammonwood videos--have enjoyed watching them multiple times!